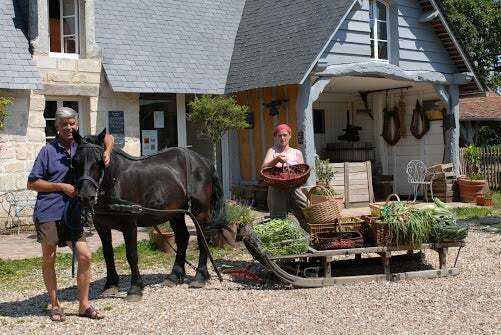 An international lawyer and a sailing enthusiast have set up a farm in Normandy which is taking the agricultural world by storm – and proving that farming without machinery or chemicals can produce yields similar to conventional methods. The award-winning Ferme du Bec Hellouin in the Eure grows its fruit and vegetables using a system known as permaculture. A 40-month study carried out between December 2011 and March 2015 by the French National Institute for Agricultural Research (INRA) into the economic viability of the farm concluded that ‘it could be easily equivalent or superior to that obtained in a classic farm’. The farm is owned and run by Charles and Perrine Hervé-Gruyer, who both worked abroad before turning to the land. They were interested in ecology – and when they came back to France they decided to set up a farm where they would experiment in how to grow the most food possible in the most ecological way for the future when oil would be scarce. The founding farmers run training courses for the public (see www.fermedubec.com/en), that have proved to be so popular that dates for 2017 were snapped up within one day of going online. Agricultural colleges are now planning to include permaculture on the syllabus. The Ferme du Bec Hellouin has 1.8 hectares and produces around 800 varieties of vegetables, fruit and herbs. There is a circular vegetable garden with narrow beds pointing into the centre, a poly-tunnel where food is grown all year round and a forest-garden where fruit trees, currant bushes, shade-loving plants and mushrooms share the same space. There are also ponds, grassy areas for the horses, sheep, donkeys and ponies to graze on and longer strips of land ploughed using horses for crops like potatoes. The farm sells vegetable boxes and also produces cider, apple juice, syrups, jams, herbs and bread. It all seems idyllic and Mr Hervé-Gruyer would agree: “Permaculture is a concept which aims to produce an agriculture which is durable in the long term and benefits from having a wide range of plants, vegetation and different areas, which attract wildlife and make it a beautiful place to work in. We have studied different forms of peasant farming from all over the world and the ground-breaking work of pioneers in America, Australia and the UK. They grow their vegetables in long, narrow beds which they do not dig or walk on, or in raised beds in the poly-tunnel area. They use mulch from hedge and tree prunings, reeds from the pond, cut grass and dead leaves and though they make some compost in bins the majority of material is put directly on the beds. Mr Hervé-Gruyer says that when you harvest a vegetable the best thing is to leave the root in the ground and let it rot there rather than put it on the compost. The idea is to get as much produce as possible from a small area and so three to nine crops are grown in the same space in one year. Crop rotation is practised but over a period of a year rather than over a four or five-year period. Different crops are planted together and the couple are constantly experimenting to find which ones grow best together. The need to water is reduced because mulch reduces evaporation but, where it is needed, rain water collected in butts or in the ponds is used as much as possible. Weeding is also reduced due to the mulch. Design is essential. In the middle of the poly-tunnel area is a large hen house – and it has been carefully located. Cuttings and waste vegetation which are not used as mulch can be thrown directly to the hens, who will eat it and turn it into ready-made fertiliser. The hens will eat the slugs and snails. In the winter they will provide heat and the enclosure is big enough for sheep as well, which provide more free heat. On top of the hen house is a flat surface for bringing on seedlings. It is warmer than ground level because heat rises. garden, meanwhile, works as a wind shield. Though they concede petrol driven machinery can be useful to create a new garden, digging a pond for example, they insist that hand tools are more effective and are developing their own tools for different jobs.